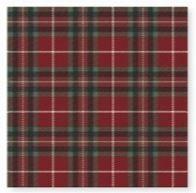 Red and green tartan design lunch sized paper napkins. These napkins are supplied in a pack of 20 3 ply napkins each measuring 33x33cm. Great product for Burn)s supper is vening.